With products sold in almost every country in the world, Logitech’s leadership in innovation encompasses a wide variety of personal peripherals (both cordless and corded), with special emphasis on products for PC navigation, gaming, Internet communications, digital music and home-entertainment control. Integrated stereo speakers: Get rich, full stereo sound for music, online videos and more with speakers precisely placed on either side of your laptop. 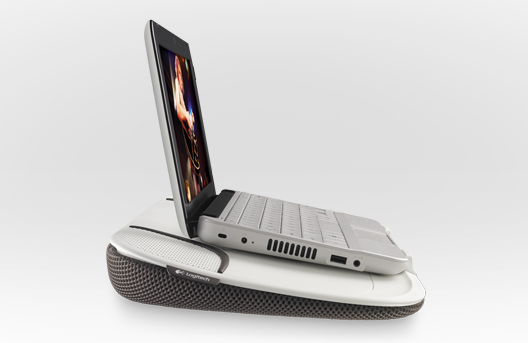 Stable surface:You can use your compact laptop comfortably just about anywhere—on your sofa, bed or even the floor. Soft air-mesh fabric: The fabric feels good on your legs. 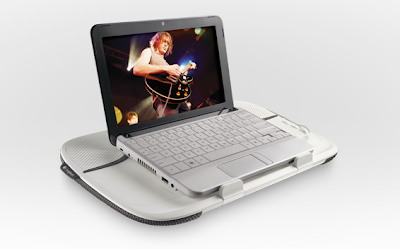 Low power consumption:Designed for efficiency, the speakers minimize the effect on your laptop’s battery. Volume control:You’ll have convenient, independent control over the speakers at your fingertips. Designed for compact laptops:Designed for netbooks and ultra-thin laptops (14” computers or smaller), the Speaker Lapdesk N550 makes it easy to use your computer wherever you like. Ten-degree angled riser:It raises your laptop to make your neck and legs more comfortable when you’re seated. Heat-shielding design:You can work and play in cool comfort—the heat-shielding design protects your body from notebook heat. I spend a ton of time on the computer in my free time, and I absolutely love watching movies on Amazon and my favorite shows on HuluPlus. However, most of the time I have a hard time hearing the audio. Problem completely solved with teh Logitech Lapdesk N550! This sleek lapdesk not only provides comfort with it's padded, breathable mesh bottom, it completely shields you from the heat of your laptop and offers the most INCREDIBLE SOUND with the built in speakers! I've watched several movies and show's with it since it arrived, and I have to say.... it's comparable to surround sound! The sound quality is better than the televisions in our home! When I'm using the lapdesk for work I don't have to worry about neck strain as the Lapdesk N550 keeps my laptop in the perfect position with it's raised base. With absolutely nothing to install (no software required) with it's "plug & play" feature, all you have to do is plug the usb cord from the desk into the port on your laptop and your good to go (no batteries, no power cords)! I'm looking forward to taking my laptop along on vacations now, I will have my own portable entertainment system.......and the kid's can use my laptop to watch movies on long car trips without straining to hear the audio. I absolutely ADORE Logitech! They make the most incredible accessories that take current technology to a whole new level! The Logitech Lapdesk N550 would be a great gift for compact laptop user's of all ages this Holiday Season! I would like to be able to either win this or have the money to buy it as my SIL has been told she has a brain tumor and she can not get up for long periods of time so this would give her something to do as they do not own a computer.